Space clearing, cleansing or energy clearing are all terms used to describe an energetic clearing process carried out in any space, indoors or outdoors or even personal space ( aura ). Basically it means clearing away any old, stagnant or negative energies and replacing them with uplifting, higher vibrations that make the space feel great, lighter and more welcoming. It is a great process to carry out in a new home or work space and is essential in any area where you may do any energy work such as meditation or reiki. There are many methods of space clearing including smudging with smudge sticks or incense, using sound, using Reiki, using crystals and crystal sprays or even meditation. It is also possible to use some of the methods to clear personal space or the aura of any person, smudging being the most popular method of doing this in many rituals. The two simple methods that I teach to my students can be used at home, at work, or to cleanse your own aura, and can be used by anyone, you don’t have to be a qualified practitioner to do it. The main point is that Intention is everything. If as you do the cleansing, you focus on clearing away any stagnant or old energies and you intend to do so, it will work, it’s the main premise of energy work. There are several methods that you can use to clear one space or a whole house. Smudging is an ancient ritual most often associated with Native Americans. It’s a simple process using a bundle of dried herbs, lit and the resulting smoke is used to clear away stagnant energies. It can be used to clear an aura or spaces in which we work and live. Generally the most common herb used is sage. Interestingly recent scientific research has discovered that burning sage in a sickroom actually kills off many of the bugs and bacteria in there, medically improving the space as well as energetically! Ready made sage smudge sticks can easily be purchased on the internet and are very simple to make too. To smudge a room, light the smudge stick and (holding it in a fireproof bowl) walk clockwise around wafting the smoke, ensuring the smoke gets into all of the corners, from floor to ceiling. you may like to open a window to allow excess smoke out. To smudge a persons aura stand about a foot away and work up the front of the body and then down the back of the body, wafting the smoke into their auric field. Once the work is done put out your smudge stick in a bowl of sand or a little water. You can simply use a heat proof bowl and your hands to waft or you can add a little extra ritual to it and all manner of smudging accessories can be found on the net including shell bowls and feathers to waft the smoke around. 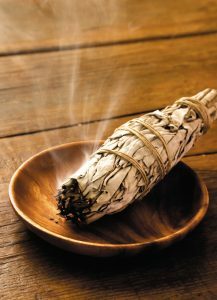 Other herbs used in smudging include sweetgrass, lavender, frankincense and myrrh. Sound also creates a vibration which breaks up old stagnant energies. 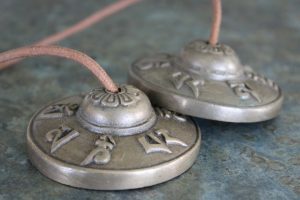 Something as simple as clapping loudly into the corners of the room and walking around the room clapping will clear the space, and you can also use bells, singing bowls or any other method of sound. simply walk around the space clockwise, paying particular attention to the corners. You can also purchase ready made crystal essences to spray around a person or a space to clear them, this is a great quick, smoke free and portable method of clearing and I often use them in spaces I can’t use smoke ( don’t set off the fire alarms it makes you really unpopular!!) or if I have clients who don’t like incense or strong fragrances. I make my own essences and charge them with Reiki for an extra boost, if you are a Reiki practitioner then you can use the space clearing symbol in the corners of the room and on the floor and ceiling too, along with the sprays. However you choose to clear your space, do it on a regular basis and work logically around the room, all of the corners, doorways and windows and remember to set your intention in your mind before you begin. 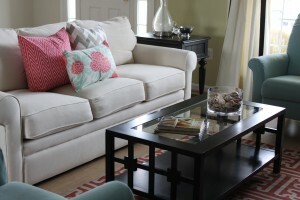 Then simply sit back and enjoy your newly cleansed, happy space.